Did you read the last post about how we made it to the top of the Takstang Monastery? If not, please do go back and read it. Before I continue, here's a check-list that will come in handy for travelers. 1. You are supposed to be fully clothed while visiting this one or any other monastery/temple or Dzong in Bhutan. Which means you cannot wear short skirts, shorts, capris or the likes. Even your hands must be covered, so choose a full or three-fourth sleeved suit, top or shirt. Alternatively, you can wear a jacket or shrug. 2. Use of photography/video is prohibited in the inner sanctum of all temples and monasteries. At the Tiger's Nest, you have to surrender your backpacks with mobiles outside with the security. There are no lockers but like I said earlier, it's absolutely safe even without the lockers. 3. Wear a good quality and comfortable pair of sports shoes if you're trekking to the Tiger's Nest Monastery. Trust me, the quality of the shoes makes a big difference. Seasoned trekkers and runners can vouch for this bit of nugget. 4. Carry water bottles and some dry snacks in your bag pack (and an umbrella if you are visiting during the rainy season). Make sure the pack isn't too heavy at the same time. Our guide was sweet enough to carry two extra bottles for us in his pack since we were carrying just one bag pack for the six of us. 5. The rise in the altitude can cause some people to become breathless, dizzy or feel uneasy. The symptoms could range from having a dull ache in the head to severe nausea. So, if you feel at unease at any point during the climb, please let everyone in your group know and stop till you feel better or if you're feeling worse, abandon the trek. Thankfully, none of us including the kids had any trouble. It took a good one hour to visit each of the smaller shrines inside the Tiger's Monastery and by the time we came out we were famished. The thought of starting on the arduous route yet again made me want to just stay back! Well, that wasn't possible and also we had to make it back to the cafeteria at a decent hour for lunch. That was incentive enough for us to dismiss our inertia and start our descent. Our stock of biscuits and some fruit came in handy. We huffed and puffed our way down, wondering if we really climbed all this way up. The path did seem to stretch on endlessly. The only way to minimize the strain, I realized, was to converse energy by talking or complaining less and just keep walking. As the cafeteria came into sight, we did not feel any less than conquerors. After filling our tummies with some yummy food, we completed the last leg of the trek to reach the base with renewed vigour. Even as I felt a sense of pride and accomplishment, I worried about the body getting stiff and dealing with aching joints. However, I was pleasantly surprised to note that other than being exhausted from a rigorous day, there was no major ache. 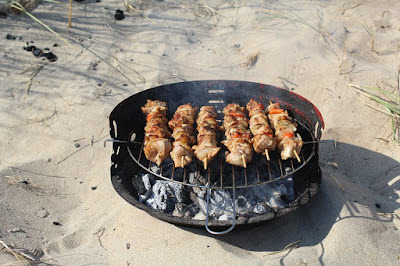 In fact, all of us were fresh and raring to go the next day with no signs of fatigue. It was the final day of our trip. 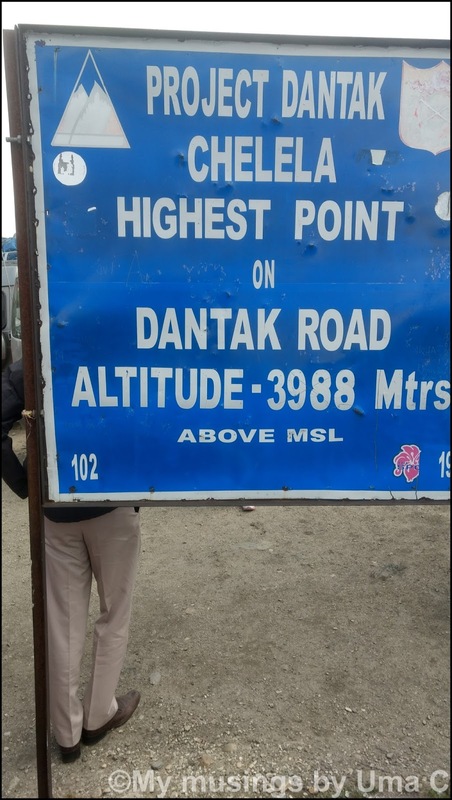 We proceeded to visit the highest motorable pass, the Chele La pass from where one can view the Haa valley on one side and the Jhomolhari peaks on the other. We caught a tiny glittering part of the snow clad peak for a few seconds. For the most part, it was as though we were engulfed by thick, moving clouds. It can get extremely windy here, so make sure you carry your mufflers, sweaters, jackets. Also, take note that there are no toilets here. A cold and windy place compounds the inconvenience? Of course! Ah, well, that's something one has to contend with here. If the Punakha Dzong was magnificent and huge, the Paro Dzong was no less beautiful if only much smaller. 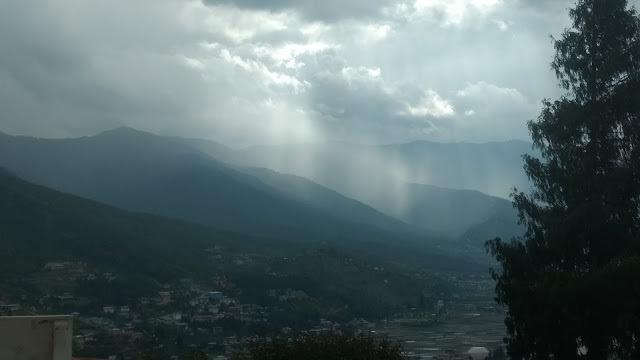 That's a view from outside the National Museum of Bhutan. Doesn't it seem like the heavens are showering their blessings? The original building that housed the museum got damaged by a fire and was under restoration. The exhibits were shifted to a temporary building which we visited. Not a large museum, it was still interesting with sections that housed information about the climatic change and its impact on humans, the flora, and fauna. Exhibits of animal masks, each animal representing a human trait or nature. Sections that spoke about the history and culture of Bhutan. Well, didn't I say we had hatched plans to get pictures clicked in the national dress of Bhutan? There was a quaint little store in the midst of this idyllic view (well, isn't the entire country idyllic?) that gave out these outfits on rent. We left for Phuentsholing the next morning. As it happens with a great vacation coming to an end, I was fraught with mixed feelings. I felt blessed to be able to create and take back some lovely memories. Although small in size and economy, there's a lot the entire world can learn from the kings/leaders of Bhutan and the way the Bhutanese conduct life. May this country ever remain as pure and pristine in its beauty, thoughts and action! 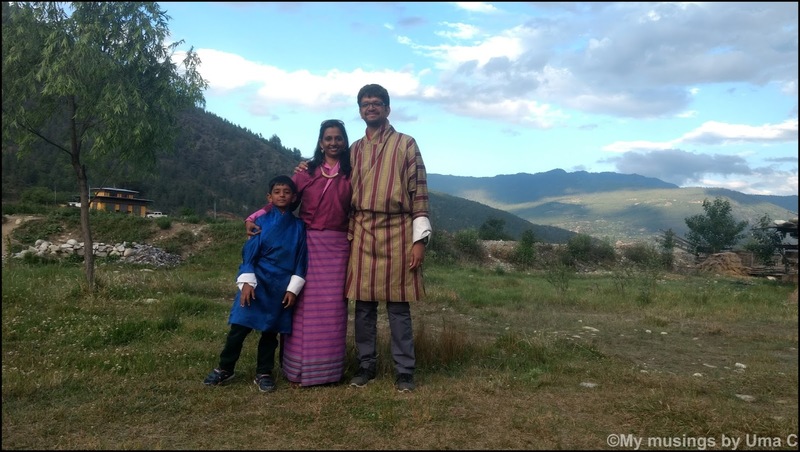 I recently viewed a TED talk on how Bhutan stands in the wake of climatic change. It's something I've been mulling over too. Will try to share my views and the video in a post, soon! Hope you all enjoyed Bhutan through my eyes. Lovely photos. This one is on my bucket list! Thank you, Damyanti! Hope you get to visit soon. Oh, that really looks my kind of destination - love mountains and nature - and it looks quite special:-) You look lovely in the outfits:-) Thanks for sharing - inspiring! Thanks a lot, Eli for the lovely comment. If you love the mountains and Nature, you're surely going to love this place. I hope you get to go soon! You make me want to book my tickets right away. I must admit, you did a great job while talking about your Bhutan travel. It was detailed, neat and very helpful.